I had a vision for this quilt and when this did not exactly go to plan I abandoned the project. Well, it has been resurrected and I have definitely been reminded why it became an UFO in the first place. I have been working on the border for the last 1 1/2 weeks. What a hassle this was! This is a bit of fun. As this is for no particular purpose or reason I felt a bit freed up to try all sorts of things. 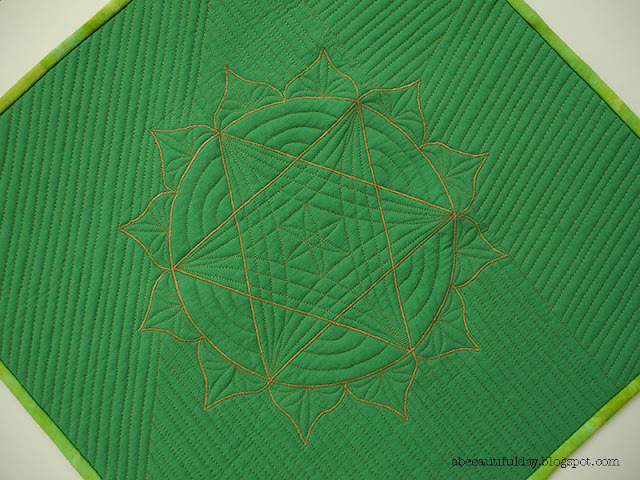 It's easy to see that my quilting follows Patsy Thompson's love for hyperquilting. My practice project is coming along. However today, when I finally sat down to continue we had a power outage, so I did not get as much done as I would have liked. The heart chakra, or Anahata in its original Sanskrit name, colors our life with compassion, love, and beauty. Anahata is unifying chakra. It is the healing center. It means living your life with loving kindness and compassion towards others. It means that your heart is open to others and you inspire kindness and compassion in others. It is associated with balance, calmness, and serenity. Anahata moves love through our life. Its color is green, higher energy frequencies can turn to pink. We are used that an effect is produced by the confrontation of two opposite forces. Love the way the boring bits of the quilting showcase the intricate bits. I have never made a wholecloth quilt, but love them. I have designed some wholecloth quilts in Electric Quilt though, and I enjoy trying to design with lines creating shapes, not crating those shapes with contrasting fabrics.